Hotel Matsudaira front entrance, c. 1950. “The Matsudaira Hotel, or ‘Hoteru’, as we learned to say to taxi drivers, was situated a few miles west of the central Marunouchi section of Tokyo on the edge of a quiet, moderately high plateau, which because of the coolness in summer is especially desirable for a residential island. “To reach it we took off from the Shinanomachi railway stop and trudged across the unpaved bus turnaround, which was either so deep in dust or so interlaced with broad puddles that we should have liked to take to geta [wooden clogs] like the swooping, laughing children who used the wide roadway as a playground. 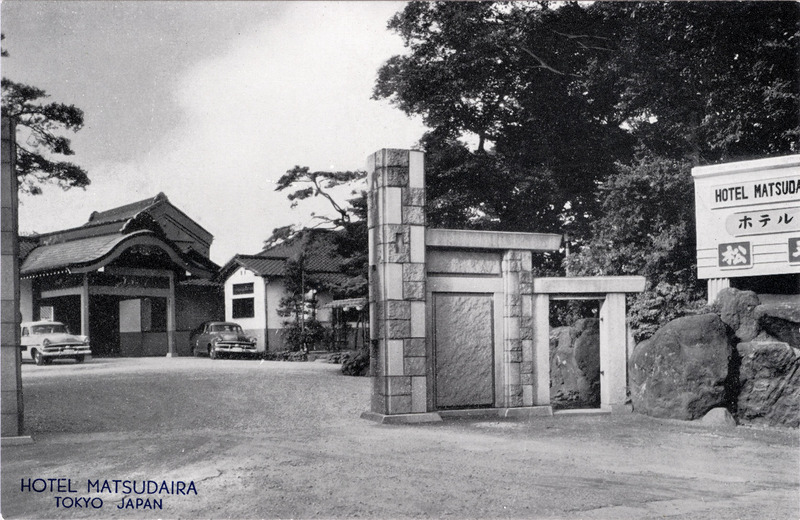 Entrance gate to the Hotel Matsudaira, c. 1950. 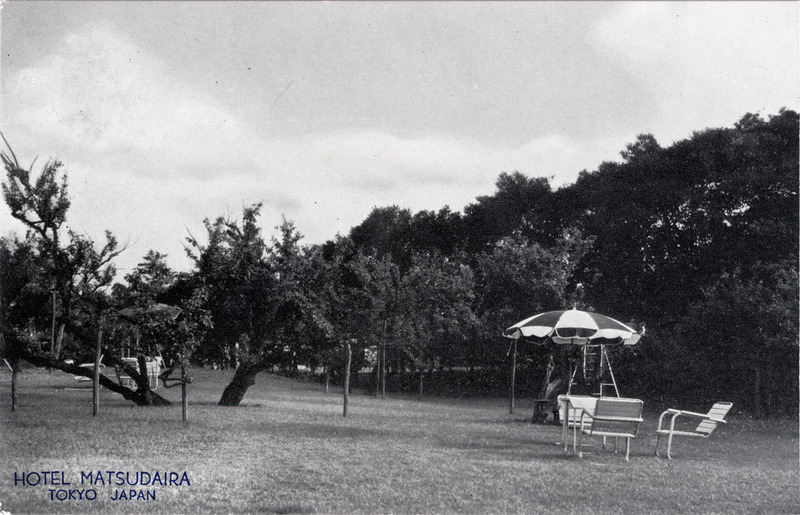 Hotel Matsudaira estate grounds, c. 1950. Hotel Matsudaira pool, and the hotel grounds. c. 1950. 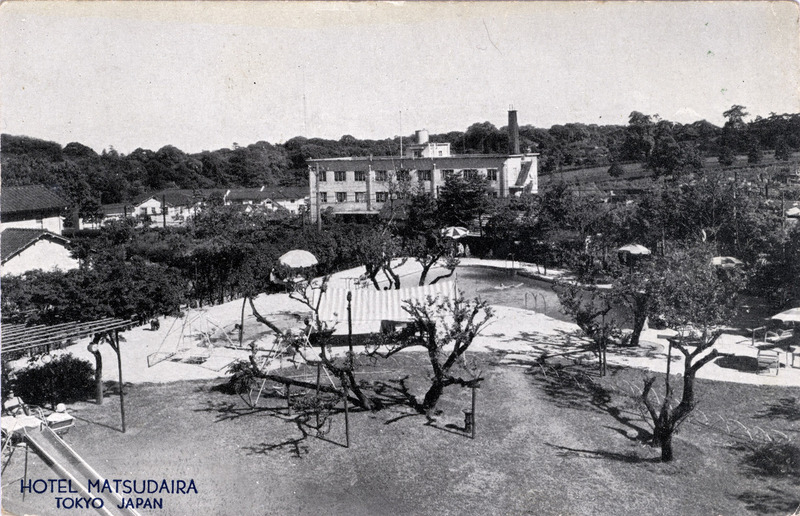 Elevated view of Hotel Matsudaira pool and grounds, c. 1950. 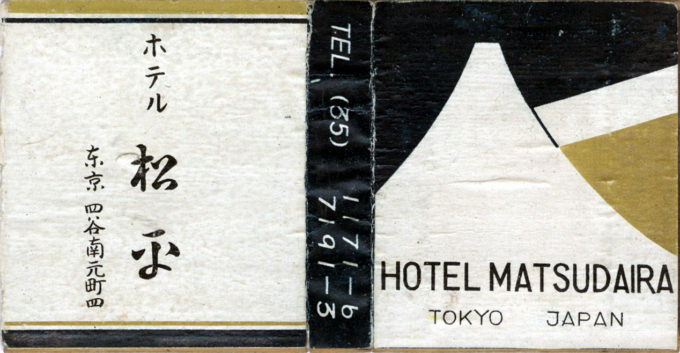 Matchbox cover from Hotel Matsudaira, c. 1950. A parcel of the grounds of the former estate and hotel would later be turned into Motomachi Park, just down the hill from Shinanomachi Station near Yotsuya. 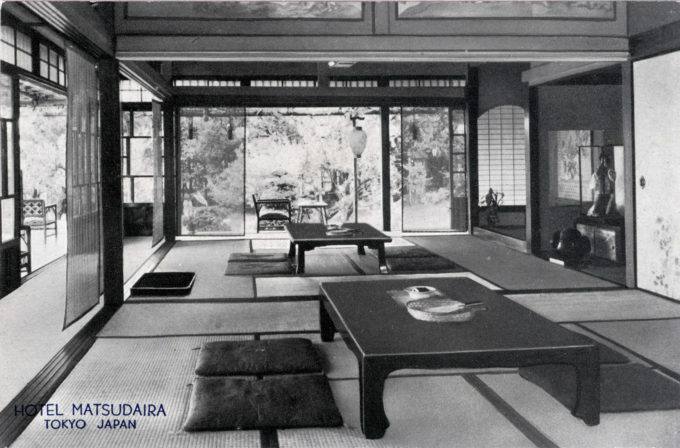 Hotel Matsudaira Japanese dining room, c. 1950. From the wiki: “Count Matsudaira Yorinaga (1874-1944) was a Japanese political figure of the late Meiji through early Shōwa periods, and served as President of the House of Peers in the Diet of Japan. Yorinaga was the eighth son of Matsudaira Yoritoshi, the former daimyo [provincial lord] of the Matsuyama Domain in Shikoku. His mother, Chiyoko, was the daughter of Ii Naosuke. Yorinaga’s his wife was the daughter of Tokugawa Akitake, final daimyo of the Mito branch of the Tokugawa clan. 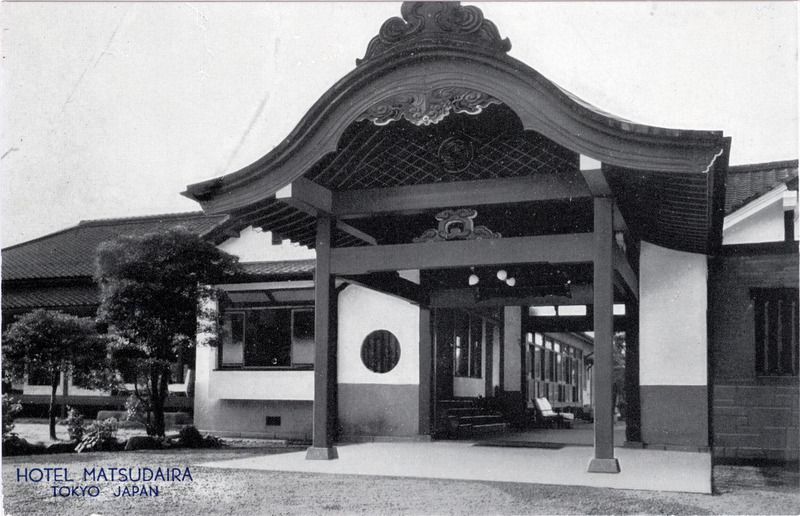 “Yorinaga attended the Gakushūin Peer’s School and, with the sponsorship of Ōkuma Shigenobu, graduated from the law school of Waseda University. In 1909 he became a member of the House of Peers, and continued to serve as a member every year (except for a hiatus between 1911–1914) until his death in 1944. 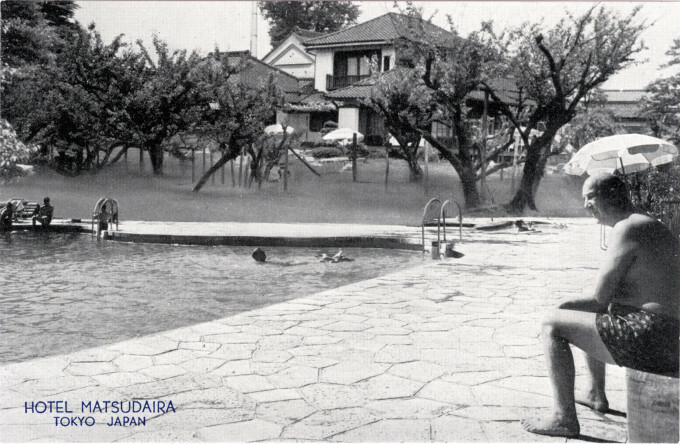 “Count Matsudaira was also a noted collector of miniature bonsai, and served as honorary president of the Kofuku Bonsai Association. His collection eventually reached a thousand specimens, but many were destroyed after his death during World War II. Around two hundred specimens were preserved by his widow, who wrote an article for the 1953 Handbook on Dwarf Potted Trees issued by the Brooklyn Botanic Garden. In 1975, she published a book in Japanese, Matsudaira Mame Bonsai Collection Album, which included photos of the couple.